The Enhanced Flame Resistant Combat Ensemble (EFRCE) consists of a blouse and trousers that make up a set. 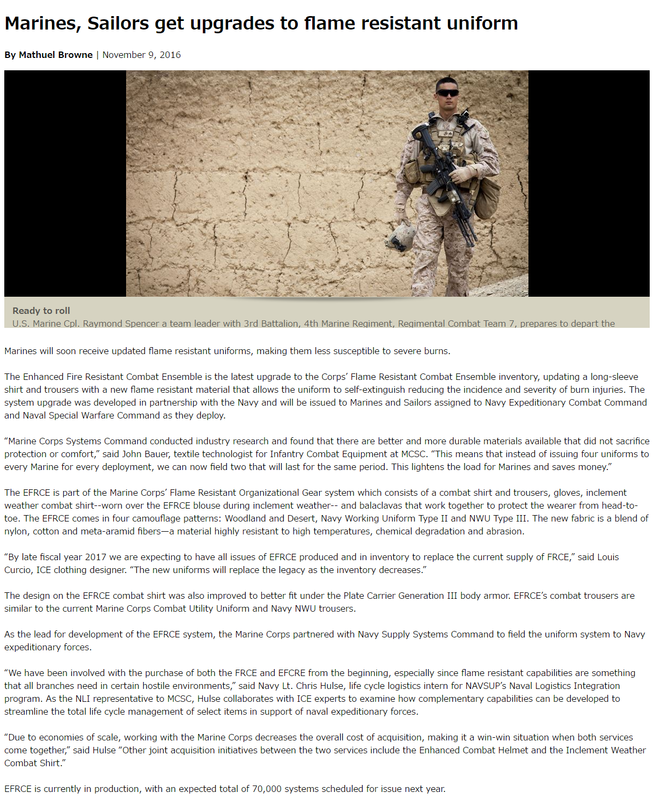 Although the EFRCE is similar to the current Flame Resistant Combat Ensemble, the design and fabrics used to construct the ensemble have been modified to provide increased protection, durability and comfort. The blouse shall be a multi-fabric design using two separate cloths for the main garment construction; a knit fabric for the torso and a woven fabric for the sleeves and collar. The blouse is designed to resemble a pullover shirt that has long sleeves. Both sleeve and collar are constructed of woven fabric and torso is knit fabric. Collar converts to a mock turtle neck for additional protection in a flame environment. The slide fastener front opening extends from the top of collar to the mid-chest. Blouse has two upper sleeve pockets with bottom bellows, a drainage hole is located in the bottom bellow of each pocket and closes with a tapered flap and concealed two-button closure. Sleeves are one-piece, single layer with adjustable wrist tabs at sleeve hem for wrist closure adjustment. The trousers have a concealed button and buttonhole fly, front panels with a centered single stitched pleat (the fold of the pleat faces the outseam), hemmed legs, seven (7) evenly spaced 1 ± 1/8 inch wide belt loops with a 3 inch belt loop opening and side waist elastic adjustments. The elasticized portion of the waist starts at the front of the pocket bearer and extends past the outseam onto the back of the trousers to achieve the finished four inches of the waist circumference for each size. The trousers have two side hanging pockets and two welt opening hip pockets. There are two pleated cargo type pockets (the pleats face the back of the trousers). The larger pocket has a flap that is bartacked at forward lower corner and one rear button closure, a bottom bellow and elasticized pocket upper edge creating an adjustable opening to secure the contents when the flap is not buttoned. The elastic cargo pocket edge requires elongation/extension when the hand is inserted into the pocket yet does not distort the trouser leg when lying in the gathered/relaxed closed position. The smaller cargo pocket has a flap with two button closures and is not elasticized. Drainage holes are positioned in the cargo pocket bellow (positioned near the back of the pocket). There are two calf pockets (the pleats face the back of the trousers) with a flap bartacked at forward lower corner and a two button closure, to secure the contents when the flap is buttoned. The calf pocket must not distort the trouser leg when lying in the relaxed closed position. All pockets, except for the side hanging ones have a flap with fusible interlining and closure with concealed buttons. The trousers have single layer external reinforcement patched at the seat and knees. The base material for construction of the blouse sleeves/chest and trouser shall consist of a flame resistant cotton/nylon/meta-aramid twill cloth conforming to Milliken style ResQ II 6.7 oz/sq yd or equal. The basic material for the blouse torso shall be a meta-aramid/flame resistant rayon/nylon/para-aramid knit fabric conforming to Burlington Sigma 4 Star Knit Style SD-1883.00 or equal. 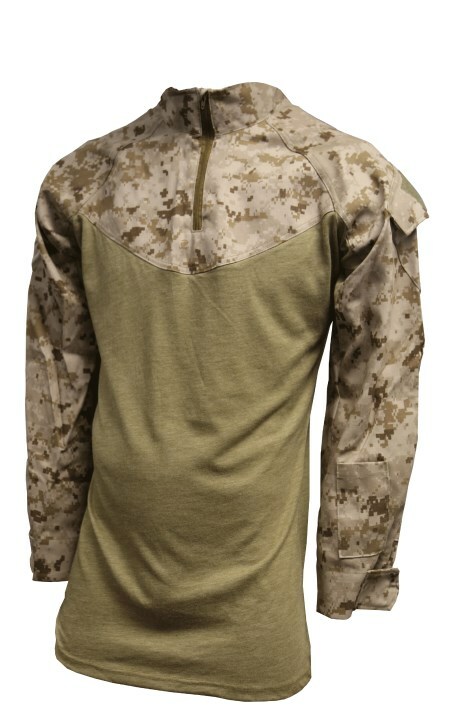 Each blouse and trouser of the EFRCE must be factory permethrin treated and must conform to the permethrin concentration levels and percent bite protection requirements, as established by the Marine Corps.